North Sumatra is a province on the Indonesian island of Sumatra. Like most of Indonesia, the coast of North Sumatra on the Indian Ocean side receives groomed swells from a westerly to southerly direction during March to the end of October. This coastal region spans a distance of about 400km’s from the South Nias Regency, north to the West Banyak island in the Aceh Singkil Regency and is dotted with hundreds of Islands, many of them with quality surf breaks. 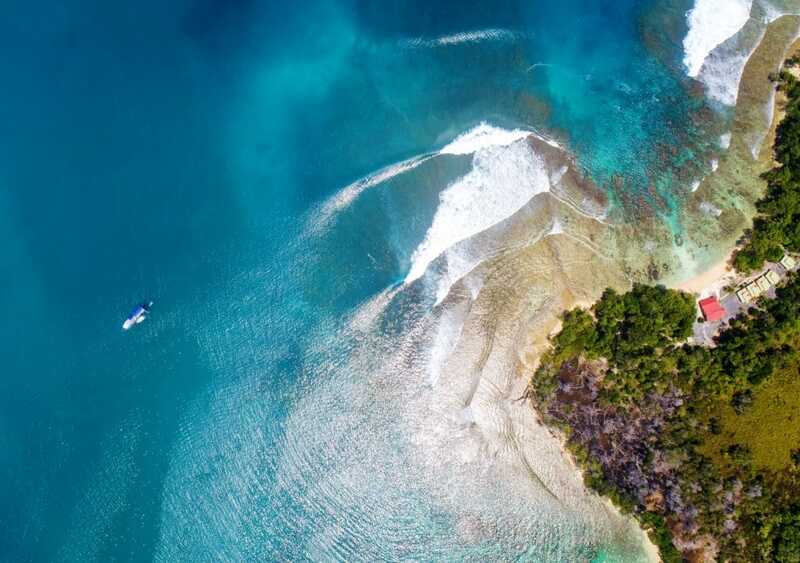 From the Telo Islands in the South, travelling north to the Island of Nias, then further to Bangkaru of the Banyak Island group, surfers are drawn to this part of the world in pursuit of perfect waves and a surf trip of a lifetime. My name is Mathew Badger, and being the booking agent of Surfbanyak.com I answer many common questions asked by guests who intend to go on a surf trip to this unique area of Indonesia. I don’t pretend to be an expert or Indo’ pioneer, but here is some handy information for someone who has not travelled to the region before. Before you book your surf trip to North Sumatra. When travelling to Indonesia ensure that your passport expiry date is valid for at least 6 months, don’t ask if that is from the beginning or end of your trip, just renew it! It is a great idea to purchase travel insurance once booking your surf trip and laying down the coin. Many people when booking a surf trip do so a year or more in advance. If something unfortunate happens between then and when you depart preventing you from making the trip, travel insurance can pick up some or all of the costs you have paid out if your claim meets the terms and conditions on the policy. Understand the travel insurance policy you have purchased by reading it or having it explained. Ask someone who has used a product how they went when making a claim. Use a product recommended by a reputable travel agent. A good travel insurer is most needed when your life depends on it. Always have your policy details and contact numbers available for emergencies. Keep all receipts, letters, doctor certificates, police reports, anything that can help when making a claim. To access Nias and the Banyak Islands for surfing, most people tend to fly via Singapore or Malaysia to Medan’s Kualanamu International Airport (KNO). Medan is the capital of Indonesia’s North Sumatra province and the 4th largest city in Indonesia by population with over 2 million people. Medan is a crowded, big and sooty city adorned with mosques, bustling streets and an outer urban sprawl that stretches for miles until it reaches the palm oil plantations, rice paddies and swamps. It takes about 2-3 hours in traffic to get to the centre via car transfer from the airport, this is why I choose to stay near the airport at one of the airport hotels when I have to overnight. There are 4star hotels in the city for a pretty good price, but for around $30AUD you get good accommodation 15minutes from the airport at the Crew or Wing Hotels and the airport itself has a hotel on site, but I have not stayed there yet. There is a rail service handy to the airport that goes directly to the city centre if you want to go in for some night life or whatever. There are other touristic activities and tours accessible from Medan, such as guided jungle tours to visit the orangutans at the riverside town of Bukit Lawang, or massive Lake Toba and it’s volcanic crater lake in the central mountains, but I will focus on the surf. 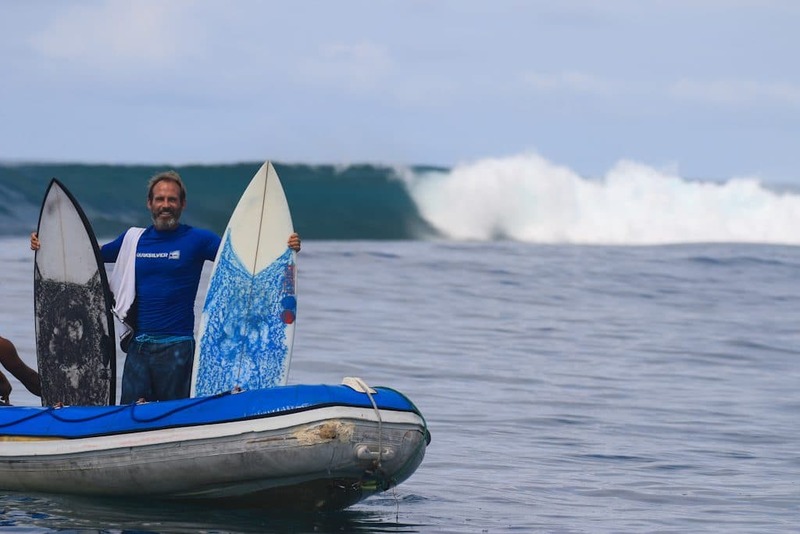 When on a surf trip to North Sumatra a visit to the island of Nias is a must for any intrepid surfer and a short stay at Sorake Beach is a great add-on to a surf charter onboard the Seriti which departs from the port of Lahewa to the north of the island. To get to Nias the best way or easiest way is to fly from Medan (KNO) to Nias, landing at Gunungsitoli airport (GNS). The Point or Sorake is famous for the epic right-hander that put Nias on the international surfing map, often referred to as one of the best waves of its kind in the world. The main peak offers up a 6 second freight train barrel and at 8ft+ a slabbing take-off that can double up and put fear into even the most advanced surfers. I was there during the famous Code Red swell of 2018 and big wave surfers like Laurie Towner and Marty Paradisis agree that at size this wave is equivalent in intensity and thrills to any wave they have surfed. When it all comes together the point can let you in pretty easy and present you with a gaping stand-up barrel that will live in your memory for a lifetime. There is a pecking order, a clique and a traditional surf etiquette in the line-up here, so observe it, adhere to it and stay out of trouble. On smaller swells there is a corner of the inside reef that offers up some fun, rippable waves. It is a great little option when waiting for the next swell or just to cool off. Surf travellers come from all around the world to stay on the point and surf this wave, you can meet some very interesting people and the vibe is mostly laidback and cool if ego’s remain under control. The region is steeped in history and culture, with easy access to villages and culturally significant sights, this area is unique and well worthy of a place on your bucket list. There are many guest houses offering accommodation along the point and Sorake Beach, most of losman style and a varying degree of quality and price. 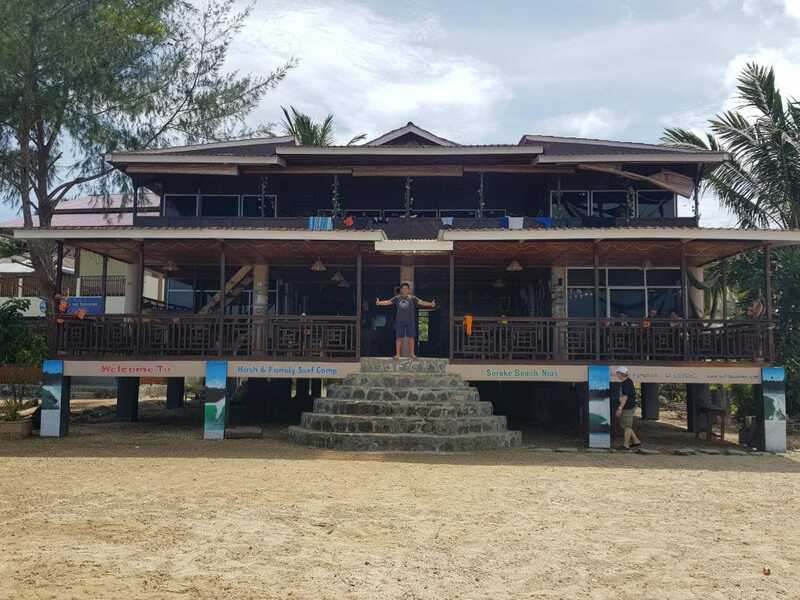 Surfbanyak recommend Hash & Family Surf Camp as a reputable accommodation in the area. From Nias you can also gain access to the Hinako Islands with some epic breaks on Asu and Bawa. There are a few surf camps and lodges in the area so if you are keen for less crowds and great breaks that can handle bigger size swell then this region is worth a look. 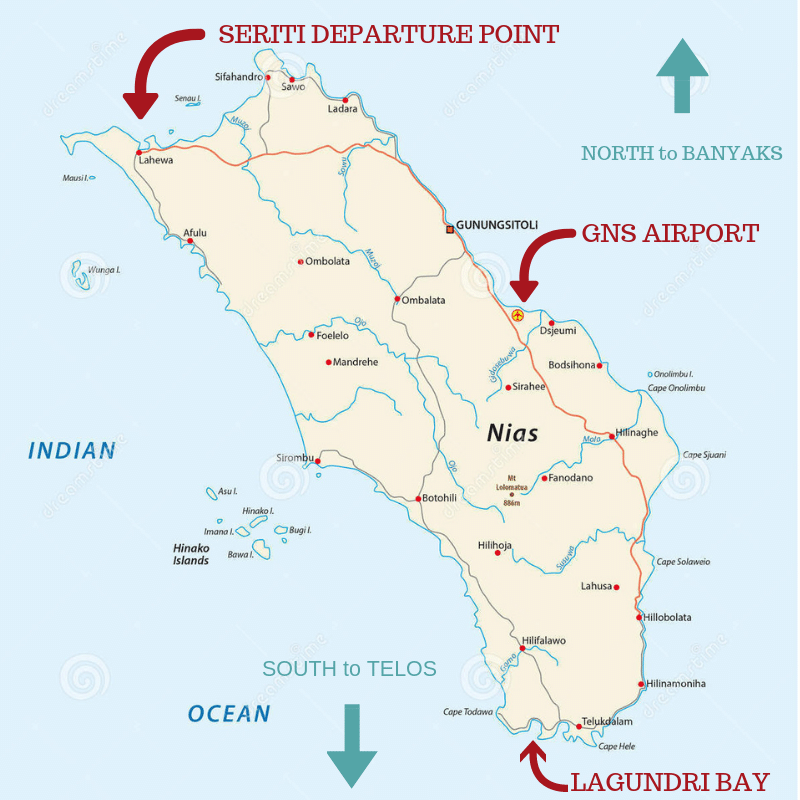 You can get there from Gununsitoli, take a bus or taxi and go to Sirombu Port about 2.5 hours away, then catch a boat to Asu or Bawa Island, also the local ferry stops at every island on the way to Asu. Further north is the majestic Banyak Islands. This idyllic tropical oasis has some of the most perfect waves in Indonesia, one being the awesome right-hander named Treasure Island (TI’s) boasting long down the line walls with numerous barrel sections. This reef break when pumping is one of the jewels in the crown of the entire North Sumatran surfing region. 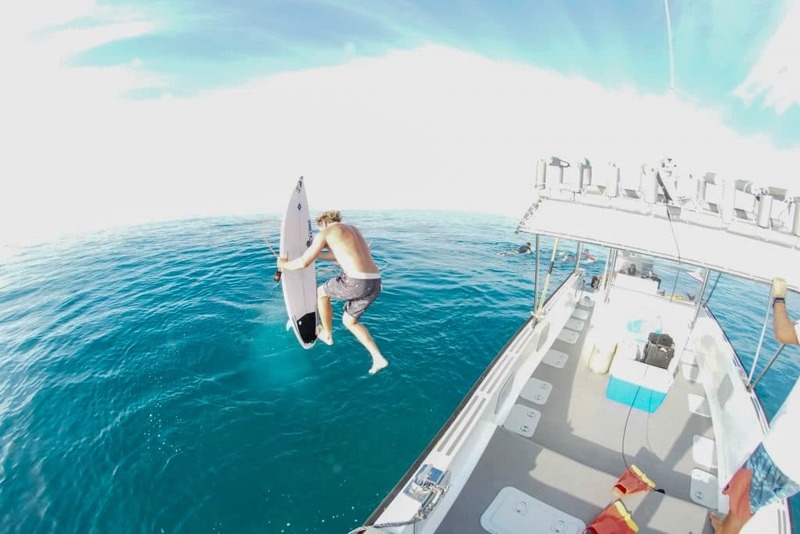 Definitely the easiest way to access the Banyak Islands is to take a surf charter. Surfbanyak guests are flown to Nias then transferred by car 2.5hours north to the port of Lahewa to board our charter boat the Seriti, from here it is a 4 to 5hour cruise to the Banyak Islands. 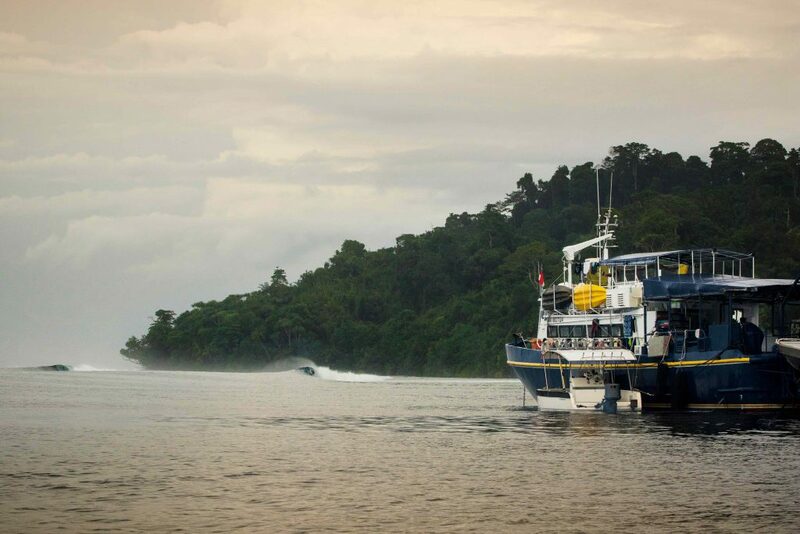 There are 5 main surf charter boat companies who operate in the Banyaks, though at times some other charter boats can do a loop from as far away as the Mentawais Islands (Ment’s) to catch a few waves up in North Sumatra. The Bay of Plenty on Taungku has accommodation and excellent waves in the surrounding bay, you can get there via a ferry from Singkil on Sumatra or have transfers arranged when staying with one of the surf camps. The issue when staying on land in the Bay is you are often limited in the ability to access many of the epic waves on neighbouring islands due to the sea being too rough between the islands for small boats to pass. Malaria can be an issue here also. • Unfortunately, the Bay of Plenty is not as spectacular as other areas in the Banyaks due to damage from the devastating 2004 tsunami, the waves are awesome, but you need to travel by boat to access a lot of the really amazing places. Apart from the surf, the isolation, scenery, flora and fauna is amazing and unique to this region. The spectacular sunsets last for an hour or more, the jungle looks like something out of the Jurassic era with fringing white sandy beaches lined with an array of overhanging tropical palms. Like the rest of the North Sumatran region the Telo Islands are adorned with more than their share of perfect waves for a surf trip. Accommodation is readily available and range in quality and price from expensive resorts to more affordable surf camps and cheaper guest houses and losmans. If you are not staying at more up-market accommodation and transfers are not included, travellers have a couple of options to get there; Fly from Gunungsitoli on Nias or take the fast ferry from Telukdalam, which is near to Lagundri Bay on Nias. Malaria is common throughout Indonesia, also dengue and Japanese encephalitis, so when travelling in North Sumatra precautions should always be taken to prevent being bitten by mosquitoes. The minimum precaution being to cover up at dawn and dusk, use insect repellent, and stay awake most of the night clearing the little bastards from your mosquito net. Take anti malaria medication when recommended and be vigilant. limit your exposure to mosquitoes when possible. If you hear of any recent cases in the area be extra careful. Onboard the Seriti exposure to mosquitoes is minimal if any, during the night we anchor off uninhabited islands with no monkeys or pigs, while mooring far enough from the shore to keep most of them away but it pays to remain careful. • Consult your doctor for all necessary vaccination and recommended medications when travelling to North Sumatra on a surf trip. I often get asked about what boards to take to the Banyaks. In reply I recommend taking the boards that you would normally ride at home in good surf conditions and take a step-up and a spare. Be aware that you are going to Indonesia on your surf trip and the best waves break over shallow coral reef, and these waves are often fast, steep and sucky. The waves in the Banyak’s are best suited to surfers with ability of just below intermediate to advanced level. When the waves reach the overhead to double overhead size range, the breaks light up and are conducive to the best surfing you have ever done. Many of the waves are down the line and have barrel sections so if you are not used to getting barrelled then be prepared to step it up a notch and pull in! During peak season: https://www.surfbanyak.com/seasonal-surf-conditions/ when the potential of getting bigger swell is high, I like to pack my standard 6’8” step-up, but my 6’3” tri-fin will hang in up to 6ft+ on most of the breaks. There are breaks in the Banyaks that are protected from the large swells, so it is not necessary to surf large waves if you are not into it. You can seek larger waves during big swells in the Banyaks, though most of the breaks max out at 8ft. 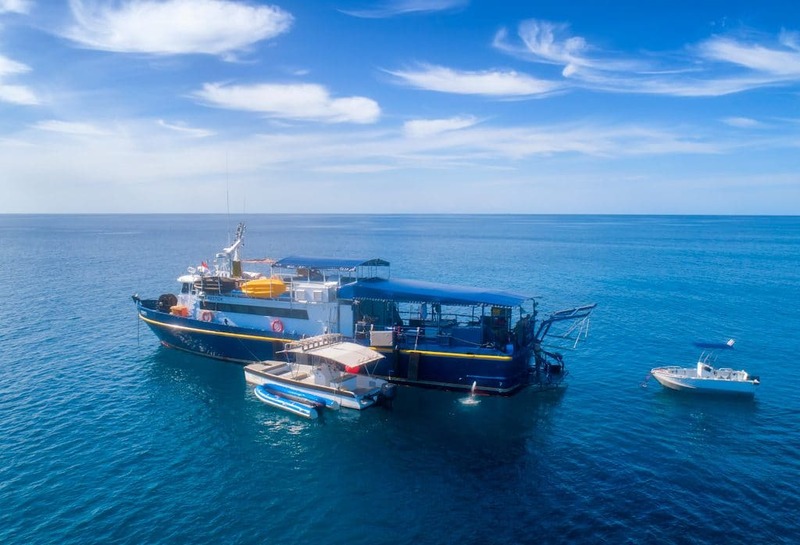 One of Surfbanyak’s major selling points is that the Seriti has 3 accompanying vessels for our guests to utilise, this is very handy when people have conflicting opinions on which break they desire to surf next. I often see people taking up to 5 boards and heaps of luggage on relatively short surf trips to Indonesia, this is fine if you like to lug heaps of stuff around and pay a lot in excess luggage charges, but there can also be issues on domestic flights getting luggage onboard and you can be delayed waiting for your boards to arrive on later flights because boards just don’t fit in. This can result in missing connecting flights and a lot of stress, so try to pack as light as you can. I have never seen anyone run out of boards and unable to get their hands on one to ride. Most people hate wearing booties because they can inhibit your surfing, but there is nothing better when you get washed into the shallow reef than a pair of these little beauties. Pack yourself a pair of booties and if you are unsure of the break or the potential of getting caught inside and having to stand on the reef, then just wear them as a safety precaution. When entering the surf from a boat, people tend to forget how much of a pain it is walking on the reef, a snapped legrope and a swim in to get your board is a quick and painful reminder how sharp coral can be. Don’t put your legrope on before entering the surf from a boat. Clean it well and treat it using the best available method. Tend to it regularly (after every surf). Keep it covered when walking on sand if on your foot. Keep it clean, dry and uncovered when possible. Get advice from the most qualified person around if it looks serious or suspicious. Infections from coral start quickly and linger on and on, so it is best to put the effort in to help them heal quickly. A large percentage of Indonesians are Muslim, particularly in North Sumatra. At times alcohol can be hard to get your hands on, so packing some duty free is a good idea if you want to get a glow up. Buy your duty-free during transit in Malaysia or Singapore, alcohol can be taken off you at the airport when in transit if you purchase it in your home country. One litre of duty-free alcohol allowed when entering Indonesia. Pack the alcohol in your check-in luggage when you get the chance. Be mindful and discrete when consuming alcohol in Muslim areas. Remove the wax from your boards before leaving on your surf trip. 3 boards in a board bag left in the Indonesian sun for a while makes a real mess if the wax is left on them. • The sea temperature reaches over 26℃ in North Sumatra so use tropical formula wax. • 1 cake per board for every 10 days surfing. • You don’t need much wax on your board when using booties. Get yourself a couple of new legropes to take on your surf trip! There are so many questions when travelling to a foreign country for the first time, I hope that this information is of some use. There is much more information about a surf trip to North Sumatra that I haven’t touched on, please feel free to email me at: info@surfbanyak.com if you have any questions.